On the open road. All photos by Deirdre Featherstone. Not all road trips require a car. 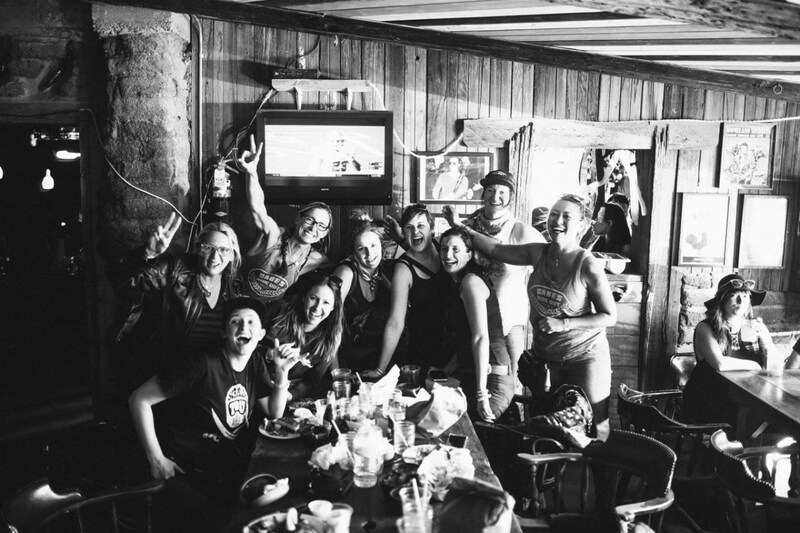 Babes Ride Out is the largest all-female motorcycle ride on the West Coast. 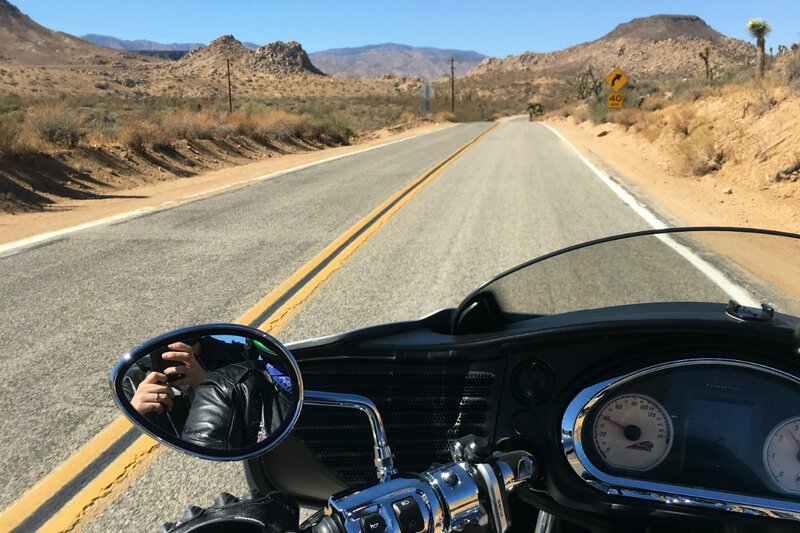 This year, more than 1,600 women participated in a four-day ride and camp in Joshua Tree, California. We checked in with jewelry designer and longtime rider Deirdre Featherstone, who just returned from the trip. I met with my friend, Dina Branis from , for breakfast before I left for my trip. She told me to relax, listen to the music, spend every minute absorbing my environment, and stop thinking that I am eight seconds from death. The Indian Chieftain: comfortable, reliable, beautiful. 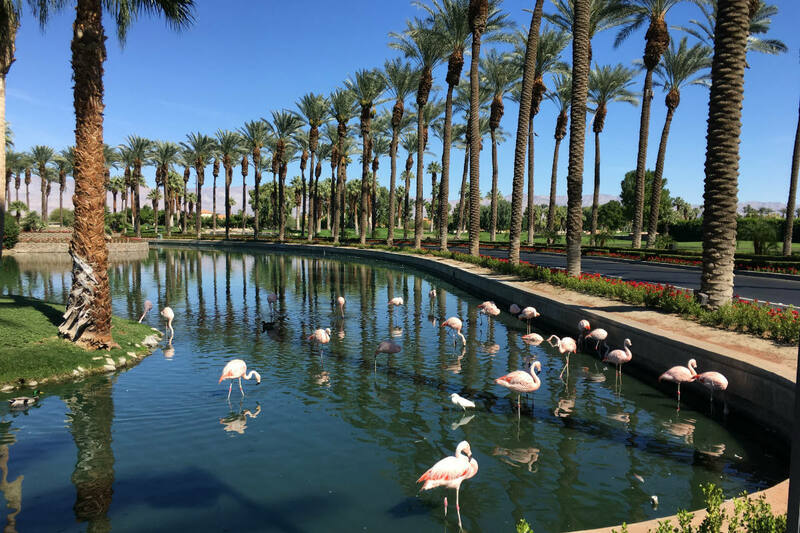 Flamingos on the golf course — a nice meeting with the locals. 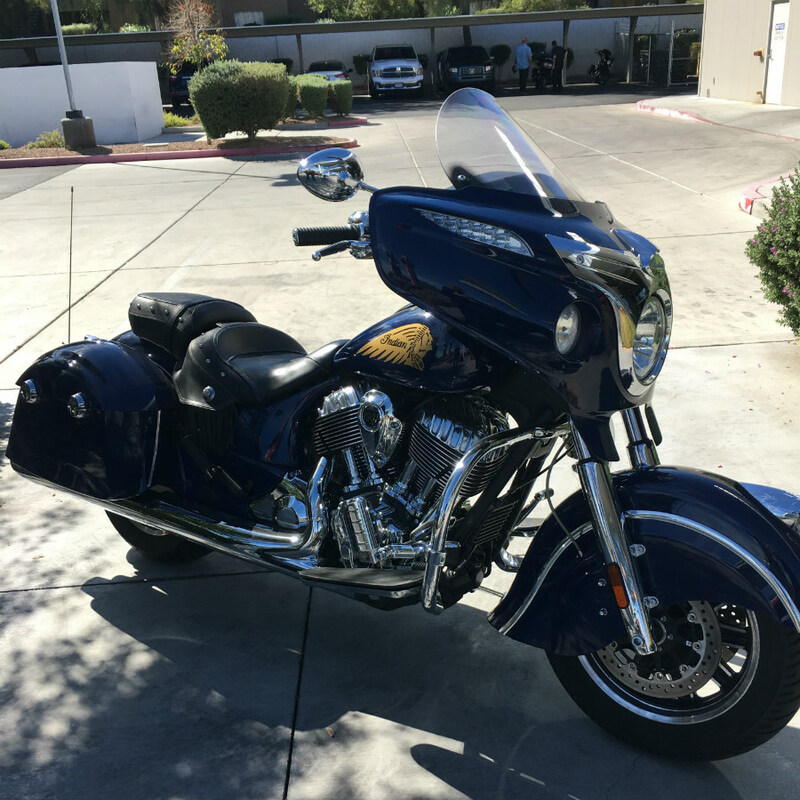 My friend Mandy Strenz and I flew into LAX, rented a Jeep, and drove to Palm Desert, where we picked up our bike, an Indian Chieftain, from . I usually ride Harleys, so this was my first experience on an Indian. We met another gal getting used to a new, bigger bike. She and I threw all of our stuff in the back of the Jeep, and Mandy led us up to Joshua Tree, caravan-style. That was a good move, because it allowed me time to concentrate on getting used to my bike without worrying about directions, passengers, or luggage. En route to the remote Cactus Mountain Airbnb. We treated ourselves to a luxurious, Old Hollywood-style evening at over an amazing dinner at the restaurant at the in Palm Springs. The next day, we drove up to Joshua Tree. 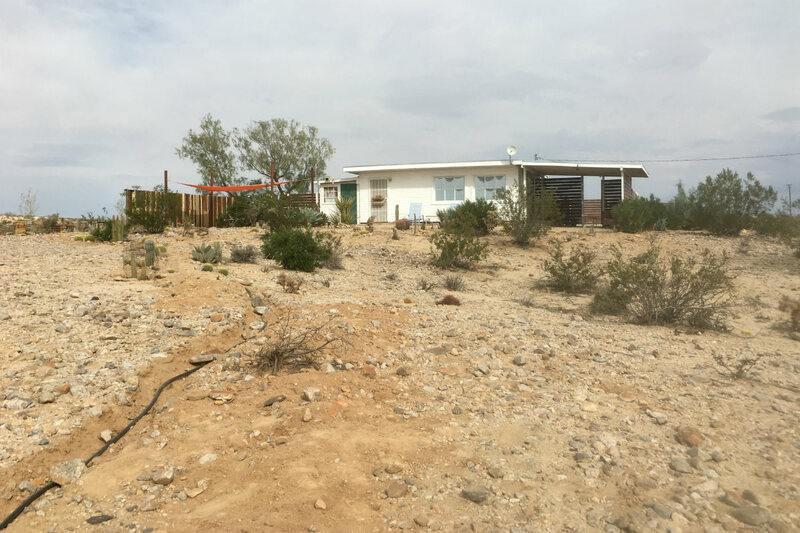 I didn't think I was the camping type, so we had originally booked an Airbnb in the desert near the campground. Those who seek out wilderness and solitude would have been in heaven at the cutest Airbnb ever, but I went back to the campground with the 2,200 other ladies (a.k.a. "babes") and spent the next few days exploring the desert and taking over Joshua Tree. 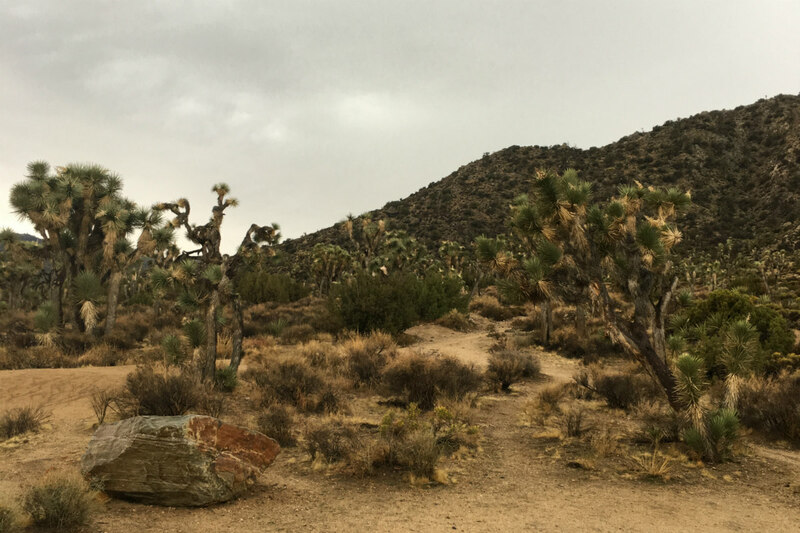 At Joshua Tree National Park, we were either very lucky or cursed: Caught in a rainstorm, we actually saw a Joshua tree struck by lightning! Along the cliffs of Lake Mead. On the last day of the event, I made one of the most excellent decisions. Instead of getting up at 5:30 a.m. (too early for me!) to ride 1,200 miles through Arizona, Nevada, Utah, and back to LA, Mandy and I rode back down to Palm Springs and returned our bike, at which point the skies opened up with torrential hail, rain, and flooding. Those on the 1,200-mile loop rode through the storm and ended up sitting on the side of a desert road the next day because of a breakdown. But we drove through the , stopping in Amboy, California, on a section of historic Route 66. When we made it to Las Vegas, we went straight to , a bar owned by my friend Michelle Dell, and stayed in a proper hotel, on North 3rd Street in the Fremont section of town. We discovered , suspended above a shopping mall. Naturally, we decided it would be our ride for the evening. We found the nearest Eagle Rider in Vegas and rented a Harley Davidson Street Glide for the day. I love to learn how things work, so we made our way to the to check out the mechanics of the large-scale project. On our way, we drove down a boat ramp to see water in the desert. At the boat launch, the nicest couple invited us for a ride on the water. Of course we said yes. 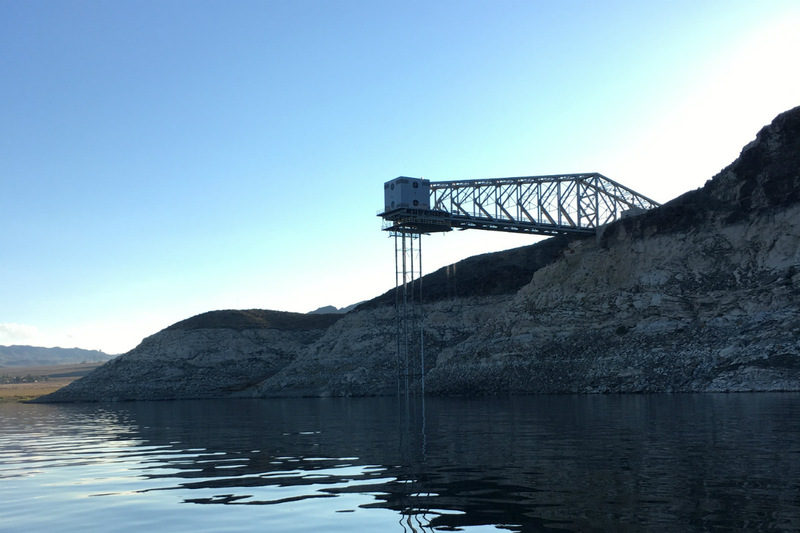 Ditching the bike, we jumped onboard and got an incredible tour of Lake Mead from perfect strangers. We saw the Hoover Dam from the water, which was better than I could have imagined. Needless to say, we didn't return the bike that day. We rode back to Vegas that night and stayed at the , where we had dinner and prepared for our trip home. Mandy and I returned the bike and drove to LAX in the morning, experiencing some legendary LA traffic en route. I had wanted to do a trip like this for a very long time. I would have loved to have been as confident on the first day as I was on the last, but you don't gain that kind of confidence without experience. One of my fears was dropping a motorcycle, which I did, but then I learned how to pick it up properly. Babes and bikes at Pappy and Harriet's. Photo by Lindsey Grace Whiddon. 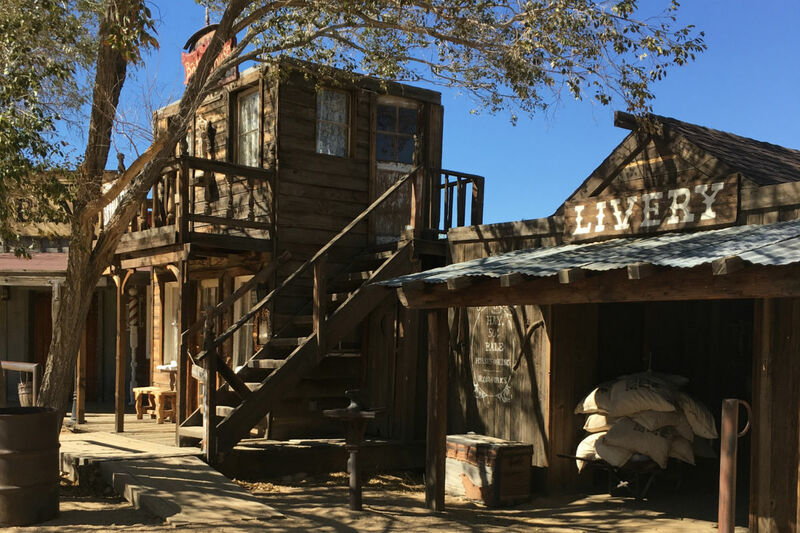 Pioneertown, a famous destination for riders, as Becoming Bulletproof was filmed on its premises. From a logistics perspective, having a gear car is the way to go. From a group riding perspective, the friendships forged were authentic and sincere. 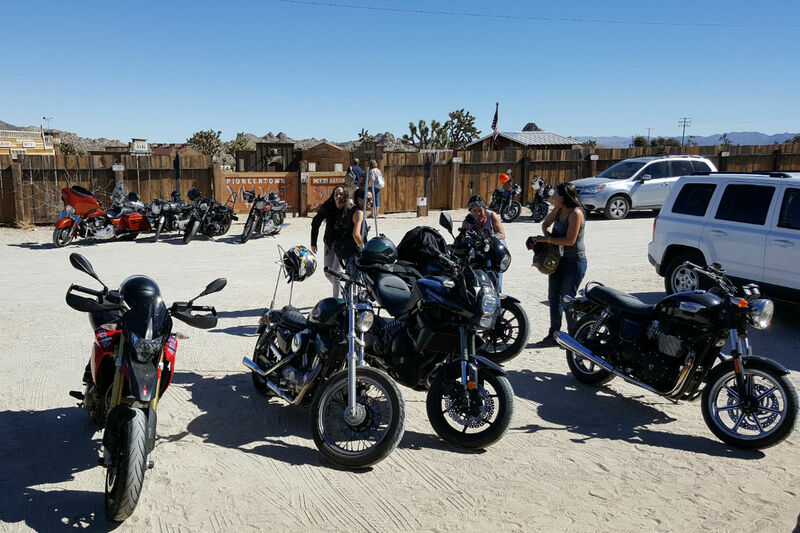 Several of us rode up to , a fun restaurant in Pioneertown, where we ate lunch and learned a lot about each other. Riding with other people requires a lot of trust, so it feels natural to open up. Pulling into our Airbnb at 10 p.m. in pitch black when the last two miles were dirt roads and the previous ten cars that we passed had been upside down. We weren't sure what was going to kill us first: scorpions, cacti, snakes, people who flip their cars, or just plain fear itself. 1. Meal or meals: serves a spectacular brunch. 2. Neighborhood to explore: Historic Fremont. The old signs were awesome. 3. Thing you did: Standing in the desert watching a tree get struck by lightning in a rainstorm! Hard to beat that. 4. Casual hangout: and , both in Joshua Tree. in Vegas for drinks. 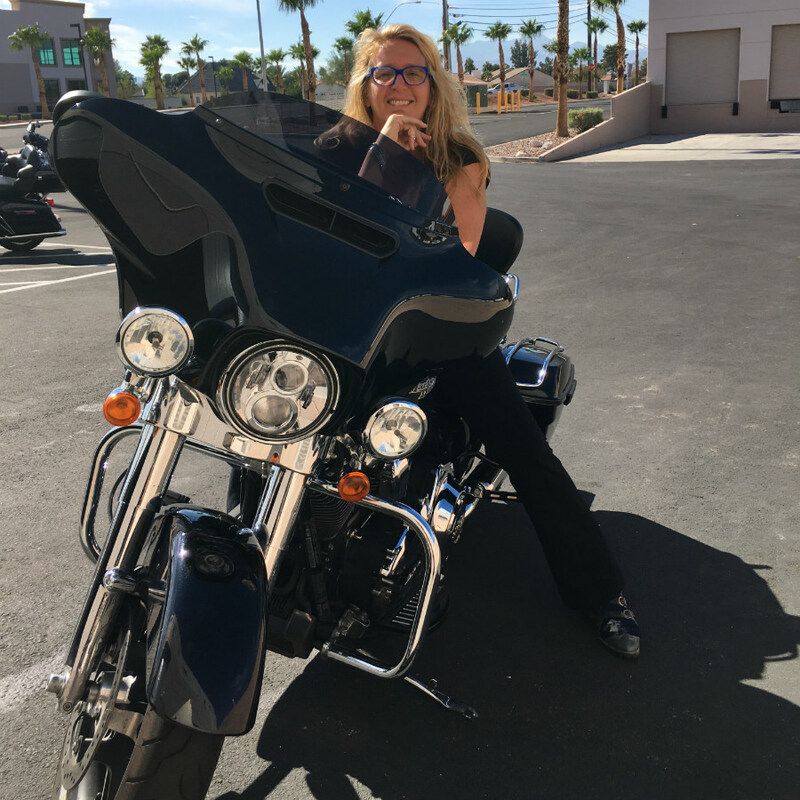 Chilling on a Harley Davidson Street Glide, the perfect bike for cruising to Lake Mead. The author and designer behind made necklaces to wear on the trip. I would have liked to see the mechanics of the Hoover Dam, but seeing it from the water definitely made up for that. The variety of women who are attracted to motorcycle riding. There were 75-year-old ladies riding huge bikes, some with sidecars. There was a hot mom with two little boys who was a firearms instructor for the military. Another woman had been in a horrific bike accident, but couldn't ditch the motorcycle habit. Stunt riders. Photographers. One woman rode 10,000 miles just to reach the event. A group from Las Vegas had completely covered their Harleys, their trailer, and their pick-up truck in Swarovski crystals. One woman had a bicycle strapped to the back of her motorcycle. One woman rode around with a full sleeve of platinum and diamond jewelry. Oh wait, that was me. How inclusive this group of riders was. They welcomed first-timers, experienced riders, and everything in between. When we met Ashmore Ellis, one of the two founders of Babes Ride Out, she was as welcoming to new riders as she was to her old buddies. Shadowriders! We got some great shots of our shadows while on the bike. Do not bring your evening gowns. Everything comes home covered in a light film of dust. I would definitely do this kind of trip again, but I'd love to ride in other places in the United States. Deirdre is an American Platinumsmith from New York City. She comes to the world of jewelry with a terrifically discerning eye for both beauty and functionality. You can follow her on . She travels for the chance to wear diamonds while riding a motorcycle.